Our first stop on the Tesla Model X road trip was in Santa Barbara, CA, to see friends & family and pop into the Tesla Service Center. Tom lived in this beautiful city for 40 years, working as a CHP officer and spending decades diving the Channel Islands as a professional underwater photographer/ cinematographer. No time for diving on this trip: we had to get a little tweak on the X before heading north. This vehicle is truly remarkable! It’s like a supercomputer, that drives itself, attached to a luxury high-end sports car. And like most computers, it sends software updates when available. As the vehicles “learn,” real time information is sent to Tesla where software is continually being upgraded, improved and incorporated into those updates. And, like most computers, this supercomputer had a teensy bug in it. Hence our trip to the Service Center. The left rear tail light is a hatch that pops open to reveal the charging port. When open, a light appears on the dash indicating its status. The indicator light on our panel kept showing the port to be open. Not a big deal but we called the Scottsdale Service Center where we took delivery of the X. Knowing we were en route to Santa Barbara, they immediately set up an appointment with that center for us. Sarah Allen, the Service Advisor, greeted us when we arrived. A vivacious gal, Sarah is a hot-rod gal to her soul but has been swayed into loving electric vehicles and is passionate about Tesla and Elon Musk’s vision to get us off fossil fuels & reduce our carbon emissions. She spent time with us chatting about all things Tesla, going over some of the computer commands we’d been show initially, and had forgotten, and handed over the keys to a gorgeous dolphin-gray Model S sedan to use while the X was in the Center. When we picked up the X the following morning (fully charged and cleaned! ), Sarah explained that it was an easy fix. The techs simply replaced the tiny circuit board for the charge port. No greasy wrenches, sockets, or screwdrivers here! I (reluctantly) handed back the keys to the Model S and off we went in our X, the light on the dash properly off. Tom’s a true car guy. He’s owed over 30 vehicles and has had some kind of issue with all of them. 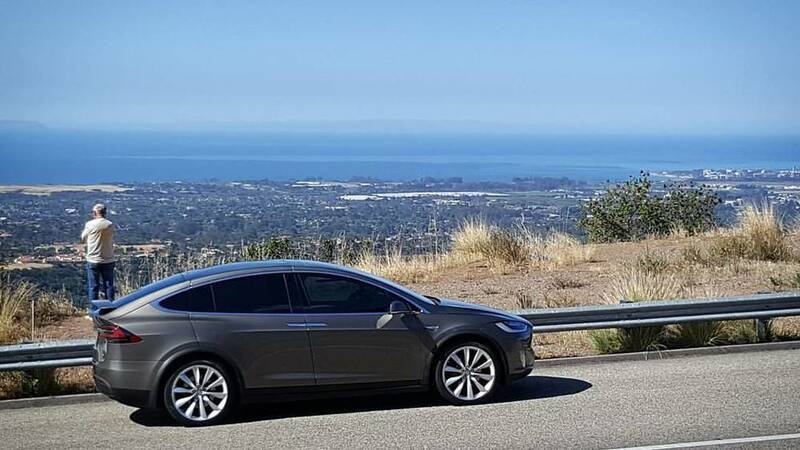 It seems, he says, like there are those who pessimistically find nothing good to say about Tesla, not taking into consideration that Tesla is a brand new concept, custom built vehicle, loaded with new and evolving technology. No car has ever come off the assembly line perfect. (He had a brand new high performance Chevy once that, within a year, had to have two cracked-block motors and a defective alternator replaced!) It seems that if a single Tesla has a flat tire it makes national news. Tom declares that this X “is the finest vehicle I’ve ever owned! It’s the most sophisticated, the most fun, and the best.” He still has a couple of old collector cars that use gas…but he’ll never buy another new gas powered vehicle again. Tesla is reputed to have the best auto service in the world and we can certainly attest to that. Sarah exemplifies the quality of people in the Centers. Tesla is the future of automobiles – and that future, as our Model X reveals and the off-the-chart service at Tesla centers supports – is now.